Let’s say you want to start a chain of restaurants focused on quality food, having guests watch sports on TV, and getting families to come in with their kids. What you need then is a nice story, like one focused on a cute family pet, plus a mascot and some quirky twists on traditional sports pub food. Of course, it helps to have a management team with a three-decade track record, the ability to test the concept in your medium-sized hometown, and to choose a location surrounded by other restaurants and things to do. With all that going for it, the new Double Dogs in Middletown is opening Monday at 11 a.m., and will be open until midnight Sunday through Wednesday, and until 1 a.m. Thursday through Saturday. I was invited to a “test-the-concept/food-on-local-bloggers event” Thursday, and came away feeling the atmosphere and food are all first-rate. 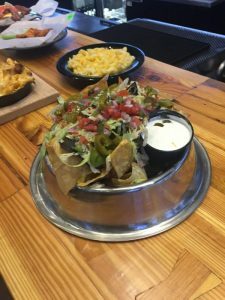 Standouts on the menu include Bo’s Dog Bowl Nachos, served in, yes, a dog bowl, and Buffalo Chicken Mac N Cheese. Also on the vast menu are a Chicken Pot Pie and Double Dogs Flat Iron Steak, plus a selection of burgers, wings, pizza and sandwiches. At $13.49, the steak is the most expensive item on the menu. An impressive video wall housed most of the 40 big-screens, and there are 45 tables inside, plus a large bar that, in the spring, will feature service on both sides, in and out on a patio. I spoke to John Morrison, vice president and director of operations, who said that at its three Tennessee locations and Double Dogs’ hometown of Bowling Green, families bring their dogs and sit outside, where the place provides water bowls and dog treats. “The concept is for families who want to have fun. We know that Louisville’s a town that likes to get out,” said Morrison, a U of L grad now living in Bowling Green. Dan Davis started what would become a restaurant enterprise in Bowling Green in 1981. Back then, I was a WKU student, and that first Rafferty’s was only the second actual restaurant out Scottsville Road, an area that is now crammed with dining options. (Imagine the Shelbyville Road spot where the new Double Dogs is located to form a mental picture.) Davis’ and Morrison’s parent company now operates 18 Rafferty’s, a Montana Grille and is a franchisee in the Corner Bakery chain. 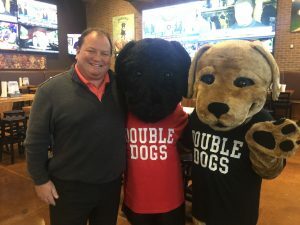 The Middletown Double Dogs is the fifth outlet for the chain, and Morrison said plans are underway to open one in Lexington this fall. Morrison has hired 85 staff positions, and expects to maintain a crew of 70, with six managers, pulled mostly from other restaurants in the company. 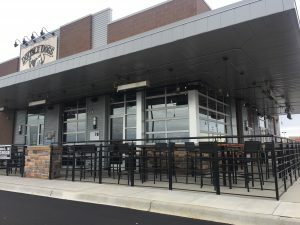 While Morrison wouldn’t comment on the cost of the stand-alone spot, it appears that little expense was spared on being prepared for battle with the likes of Buffalo Wild Wings less than a mile away, plus three area Beef O’Brady’s locations and a bunch of sports bars. Perhaps the difference is dogs. Two life-sized mascots, Bo and Chancey, were in attendance Thursday, and Monday’s opening includes a ceremony with the Kentucky Humane Society. The restaurant will name one special K-9 service dog with the Louisville Metro Police Department an honorary Double Dogs Chow House Pup. Officer John Kirk and his canine, Bosco, will be on hand at 3 p.m. for a special presentation. Bosco specializes in detection work, tracking people and evidence to crimes as well as aiding with drug and substance abuse cases. Morrison said he’s seen as many as 14 canines on the patio at Tennessee stores, but added that dogs aren’t allowed inside the restaurant. “We really do love dogs,” he said. 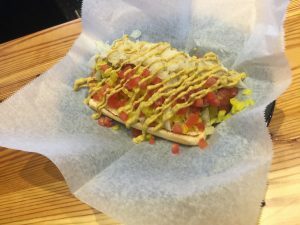 This entry was posted in Eat, Featured, Local News, Louisville Restaurants and tagged Double Dogs, John Morrison.